Ahhhh healthy living. Sounds so good in theory, right? But then when you get down to business, not only do you realize just how challenging it can be to shift old habits, but you also have the price tags. The healthy food fees are just too damn high. That's why we love Maria Marlowe. She's a healthy living extraordinaire, serving her clients relatable, approachable, and affordable advice on how to make the best choices for their bodies. 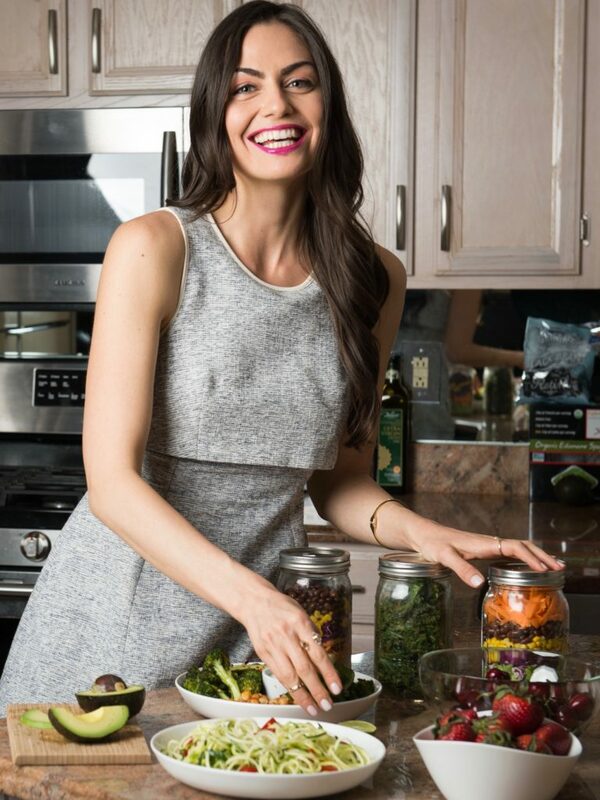 She is am Integrative Nutrition Health Coaching based in New York City and has worked with hundreds of career women, moms, working moms, and a number of celebrities and top executives on their health goals. Now, she has published her first book, The Real Food Grocery Guide, which has quickly become our go-to resource for purchasing healthy foods without breaking the bank. We sat down to ask Maria a few questions on what it truly takes to be a grocery store warrior. What is the biggest misconception about healthy eating on a budget? People often think it's impossible to eat healthy on a budget but it isn't! There are so many great economical choices. Frozen produce and seafood are typically just as nutritious, but much more wallet friendly. You can stock up on grains, beans, nuts, and seeds from the bulk section, which again are typically cheaper than pre-packaged. And I highly recommend buying all of your non-perishable products - like snack foods, spices, oils, flours, etc. online at vitacost.com, as prices are 25-50% cheaper than in stores, for the same brands. This will save you a ton of money, so you have a little more to save on fresh produce and animal products at the grocery store. You have written a book about shopping for healthy foods when you’re balling on a budget. If you could go to the grocery store with your readers, what would be your go-to purchases for them? Everyone enters the grocery store differently. Some people bring recipes. Others bring shopping lists. And some just pick up items as they go. Is there a system you believe works best for scoring nutritious products and staying on budget? Never go hungry is rule number one. :) Ideally, go in with a grocery list, so you know what you need and try to stick to it, to avoid impulse purchases. Meal planning beforehand can help you come up with a solid grocery list. But, also be open to seeing what's on sale, and swapping ingredients like broccoli for cauliflower or kale for chard if one is on sale. You could also make recipes for the week based on what is on sale. What is your perspective on meal prepping? Do you recommend it? I think meal prepping is a great way to ensure you eat healthy meals throughout the week, without resorting to takeout! Batch prepping or cooking on the weekends saves a tremendous amount of time, and makes healthy eating easy. I outlined how to batch cook like a boss here. It can be difficult to buy fresh foods when you’re just shopping for yourselves. It can go bad before you’ve even had the time to eat it and it can be expensive. How do you recommend buying fresh when you’re only purchasing for one person? Meal planning is one great way to prevent this from happening, because you'll have an idea of what you're eating when, so you can plan accordingly. Even if you don't want to fully plan out every meal, if you take just five minutes to look at your schedule for the week, and think about which meals you will be eating at home vs out, you can get a better idea of how much produce you will need. You can salvage fresh fruit that is about to go bad by peeling it or pitting it if necessary (for example peel a banana or mango, and remove the pit of stone fruit like a nectarine or peach), chopping it up, and putting it in a zip top bag in the freezer for later use in smoothies. Most fresh fruit that's about to go bad in a day or two can easily be frozen. You can salvage veggies that are soon to go bad by turning them into a soup or stew, and then even freezing that if you won't be consuming right away. Frozen fruits and veggies are a great option to stock up on for times when maybe you run out of fresh produce or just want something quick and easy. Small changes lead to big results, so instead of trying to change everything at once, first focus on adding in the good things. My first suggestion is to always aim to make 50% of your plate vegetables or fruit at as many meals as possible. Once that becomes a habit, make sure you're drinking enough water daily or focus on reducing or eliminating refined sugar. By adding on a new habit one at a time, healthy living becomes much easier and less overwhelming. Want to learn more from Maria?